Well-engineered effects speakers like SVS's Prime Elevation models can help create that seamless "acoustic bubble" that makes home theater so immersive. 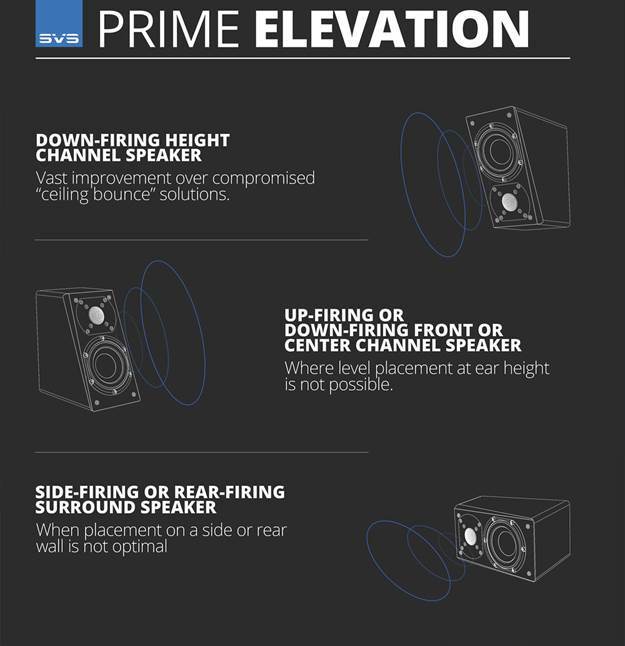 More than just height effects speakers, SVS's Prime Elevation models can be used as side or rear surrounds, or as main left/center/right speakers. The Prime Elevations can be used as direct-radiating height effects speakers for the latest object-based audio formats like Dolby Atmos®, DTS:X®, and Auro-3D®. The common approach for Dolby Atmos speakers is bouncing sound off the ceiling from below, but that requires ideal room conditions, and the speakers' frequency response must be limited. SVS's Prime Elevation models don't rely on reflecting sounds off the ceiling. Because they're designed to be mounted high on the wall, Prime Elevations also make great effects speakers for older surround systems. With its angled front baffle, Prime Elevation can also be used as left or right fronts, a center channel, or side and/or rear surrounds. Their accurate, open sound will remind you of high-end bookshelf monitors. They perform well in rooms of all shapes and sizes. The Prime Elevation's 4-1/2" woofer cone is made of polypropylene, which is extremely lightweight and rigid, allowing the woofer to sound clear and natural through the midrange. Elevation Speaker: The SVS Prime Elevation is a versatile loudspeaker that can play many roles in a home theater surround sound system. Designed to easily mount directly to the wall with the multi-purpose wall bracket (patent pending), the SVS Prime Elevation can be used as direct-radiating height effects speakers for immersive object-based audio formats such as Dolby Atmos, DTS:X and Auro 3D. With its angled front baffle, Prime Elevation can also be used as left or right fronts, a center channel, surrounds and surround back speakers to provide crisp, dynamic sound in rooms of all shapes with all different architectural features. Immersive Surround Sound: Exciting new surround sound formats such as Dolby Atmos, DTS:X and Auro 3D, often referred to as "object based surround sound", unleash the ultimate immersive home audio experience by incorporating sound effects emanating from overhead. Previously, surround sound only existed on a single plane, but Height Effects Speakers (like the SVS Prime Elevation) are introducing a higher dimension of home theater audio. 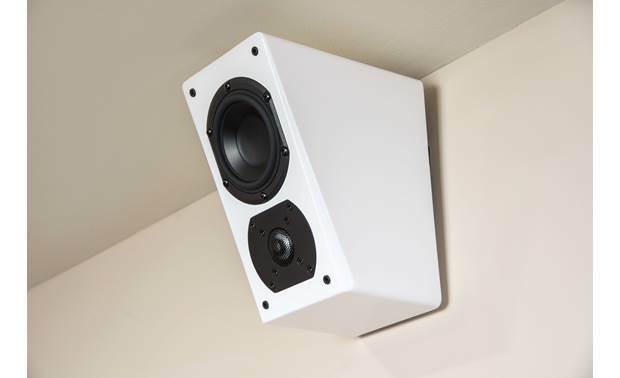 The standard approach to height effects speakers, bouncing sound off the ceiling from below, requires perfect room conditions and frequency response limiting of the speaker, both of which negatively affect sound quality. 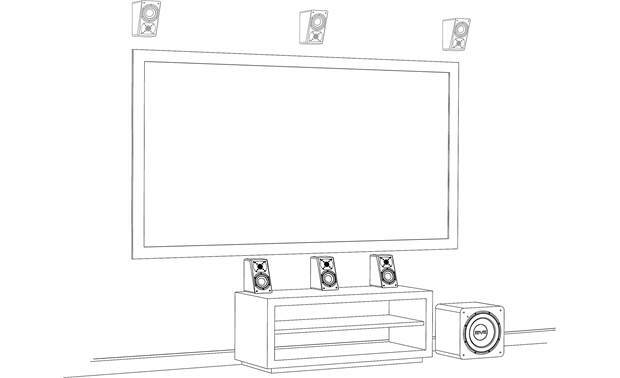 Unfortunately, this method doesn't work well in many rooms (due to room shape, ceiling design and a number of other factors) and even when it does work, not all listening positions enjoy the same level of impact or immersive effects as they do with a full-range, direct radiating solution like the SVS Prime Elevation. 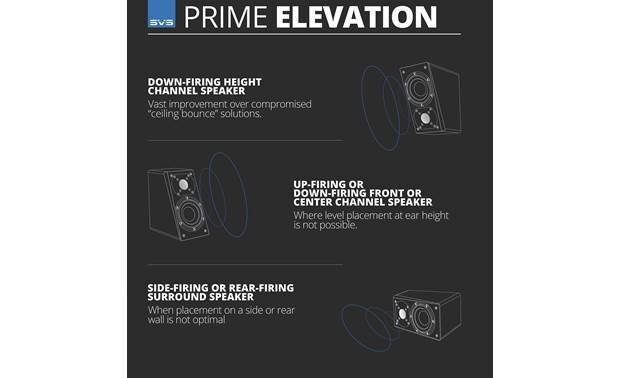 The SVS Prime Elevation is an optimal height effects speaker because it directly radiates full-range sound to the listener, refuting the compromised ceiling bounce approach. This novel solution provides an uncompromised listening experience for anyone who wants to enjoy maximum sonic impact from their state-of-the-art home theater. Mount it high on a wall near the ceiling using the simple multi-angle wall bracket (patent pending) and object based surround sound (like Dolby Atmos & DTS:X) can be enjoyed at full fidelity in any room, without the compromises of ceiling bounce or in-ceiling speakers. Two-Way Driver Design: The SVS Prime Elevation utilizes a two-way driver design with a 1" aluminum dome tweeter, 4.5" mid-woofer, and SoundMatch crossover (2.3kHz @ 12dB/oct). 1" Aluminum Dome Tweeter: The Prime Elevation speaker's 1" aluminum dome tweeter is light, efficient, and rigid, and plays crystal clear at high volumes for an exceptional transient response. The tweeter utilizes an FEA-optimized diffuser for even greater clarity with a sense of utter transparency, while also offering an "airy" presentation and incredibly unveiled highs so female vocals and dialogue always sound natural, crisp and smooth. Angled MDF Cabinet: The Prime Elevation speaker employs an angled cabinet with MDF construction and internal bracing for resonance-free sound. The speaker cabinet's chamfered front baffle, flush-mounted drivers, tapered edges, and acoustically transparent FEA optimized grille minimize edge diffraction and improve on-axis high frequency response for clear, precise sound staging. Each speaker cabinet also utilizes a 1" wide-flared rear-firing port for greater efficiency and smoother response. All of these advancements are packed into a compact but attractive cabinet, that's available in a piano gloss black, piano gloss white, or premium black ash finish. 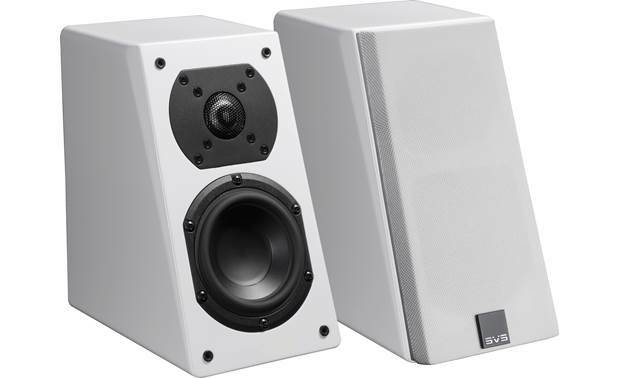 5-Way Binding Posts: The SVS Prime Elevation loudspeakers are outfitted with 5-way binding post terminals for connection of bare wire, pin-connectors, spade-lugs, and banana connectors (single or dual). Use 18AWG speaker wire for wire runs up to 10', 16AWG speaker wire for wire runs up to 25', 14AWG speaker wire for wire runs up to 50', and 12AWG speaker wire for wire runs up to 75'. Applications: The SVS Prime Elevation's angled front baffle, multi-purpose wall bracket (patent pending), and advanced engineering enable it to perform amazingly as front, surround, surround back, or height speakers. It can even be used in a bipole/dipole configuration. The Prime Elevation is acoustically engineered to offer the same amazing performance no matter what role its playing. Height Effects: Use Prime Elevation as down-firing height effects speakers for vast improvement over compromised "ceiling bounce" solutions or for easier installation versus in-ceiling speaker solutions. 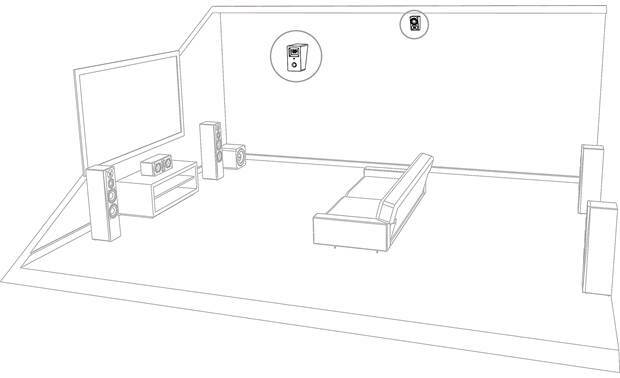 In this setup, the SVS Prime Elevation speakers should be mounted to the side walls or rear wall (with the woofer and tweeter angled down), as close to the ceiling as possible. Surround/Surround Backs: Use Prime Elevation as surround or surround back speakers, placed on side wall for rear effects or rear wall for side effects when optimal placement is not possible. As a side surround, the Elevation can be placed towards the back of the room in a front firing position. For rear surround channels, the speakers can be placed on a side wall in a rear firing position. Since the angled front baffle is directing the sound towards the back wall, it will provide rear surround effects and a diffuse soundfield. For the best sense of spaciousness, we recommend the tweeter height of your speaker be about 2' above ear level at the listening position. If overhead effects speakers are already being used in other channels of the system, we recommend mounting the Prime Elevation closer to ear level when used as surround speakers. Up or Down Firing Fronts: Use can also use the Prime Elevation as up or down-firing front speakers placed above or below the listening area. The speakers can be placed down closer to the floor and angled up towards the listening area, or placed across the top of the front wall and angled down towards the listening area. Bipole/Dipole: A pair of Prime Elevation speakers can be used together to make a traditional bipole or dipole surround speaker (you will need to purchase two pair of Prime Elevation speakers). To do this, you will use one surround channel from your AV receiver, and the speakers must be wired together in series (see owner's manual for wiring diagram). In bipole mode, both sets of speakers have the same output, which is "in phase". This will provide a more localized and directional surround sound effect. In dipole mode, one Elevation speaker is electrically reversed from the other, or "out-of-phase". This will provide a more diffuse and non-directional surround sound effect. Mounting Options: The SVS Prime Elevation speaker addresses a multitude of mounting & placement challenges thanks to its angled front baffle design and multi-angle wall bracket (patent pending). Even in the most challenging rooms, installation is a snap with the included template and mounting hardware. Multi-Angle Wall Bracket (Patent Pending): Since the Prime Elevation will often be wall-mounted, SVS engineers specially designed the innovative multi-angle wall bracket (patent pending) so you can easily position and install the speaker in any of four directions (up or down-firing and side or rear-firing) to get the best performance possible. Mounting hardware and template are included. 1/4"-20 Threaded Insert: The SVS Prime Elevation also features a 1/4"-20 insert that works with many other mounting brackets (sold separately). 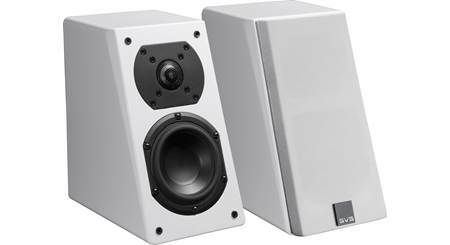 Rubber Feet: The SVS Prime Elevation Speakers include stick-on bumpers that can be attached to the bottom to offer protection when placed on speaker stands, desktops, shelves and other surfaces. 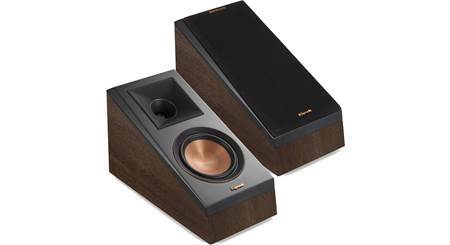 These rubber feet add approximately 0.125" to the overall height of the speakers. Searches related to the SVS Prime Elevation Height effects speakers.